Olivier Amrein (oenvoyage) added a comment to T63803: Toggle Fullscreen Area: Shortcut and Search not functional . I also noticed the same on MacOsx. 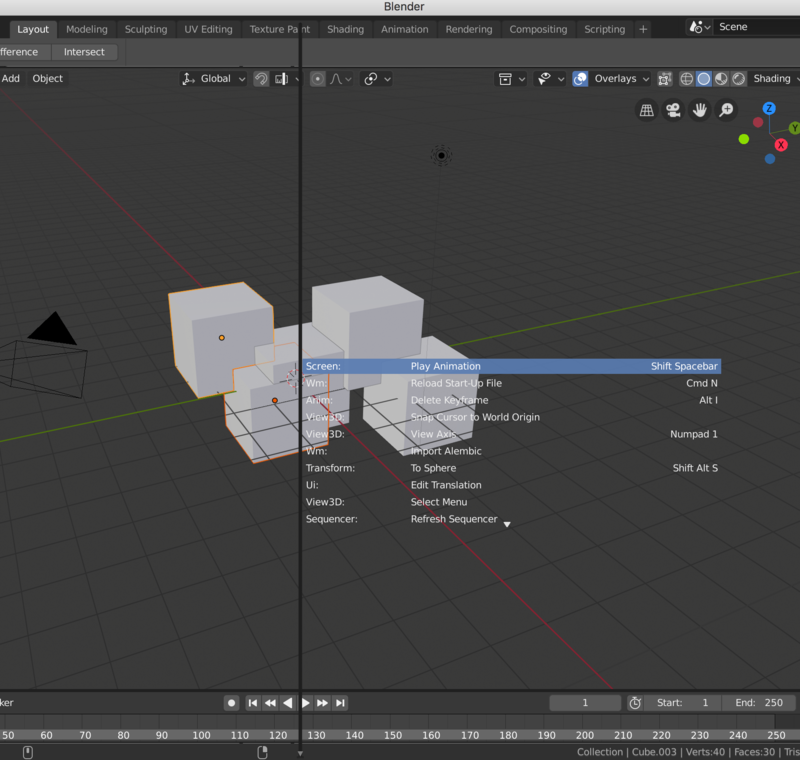 The Toggle Fullscreen works in all the editor except the 3D View. But once I reset to factory settings it went fine. It seems there is a conflict with the "Pie Menu : Official UI Pie Menu" addon, because it shows me an empty Manipulator kind of pie (see image) . Are you sure you have Vanilla blender ? Can you try if it still happens when you factory reset? Olivier Amrein (oenvoyage) awarded D4071: New Drag & Drop System [WIP] a Love token. Olivier Amrein (oenvoyage) created T59092: Setting Dynamic Paint brush as particle crashes when selecting a particle system. Olivier Amrein (oenvoyage) added a comment to T59063: Small UI bug. Olivier Amrein (oenvoyage) committed rF3269be9356f6: removing last bits of brender mentions (authored by Olivier Amrein (oenvoyage)). Olivier Amrein (oenvoyage) added a comment to T49902: How do I get blender to run scripts from command line in headless mode? 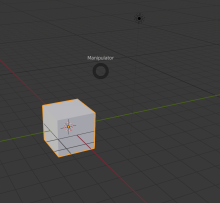 It segmentation faults when I do with blender -b.. I tried on 2 different macs imac and MBP both with Sierra, and it worked fine. I have 2.78a though, the latest version. Can you download 2.78a and try if it works ? Olivier Amrein (oenvoyage) added a comment to T45536: ERROR TO STARTUP BLENDER. I think your report is not precise enough. Did blender run with previous versions ? Which ones ? did 2.74 work? Have you tried installing it on another computer ? Update windows and your graphic drivers ? Olivier Amrein (oenvoyage) created T45510: small bug: Editing a disabled animation channel's path editing text input is too short. Olivier Amrein (oenvoyage) created T44836: crash when multi-view is enabled and switching to BI rendered viewport display. Olivier Amrein (oenvoyage) awarded T42788: animation rendering crashes when 2 3d Views set to "material" shading mode are shown a Baby Tequila token. Olivier Amrein (oenvoyage) added a comment to T42788: animation rendering crashes when 2 3d Views set to "material" shading mode are shown. I forgot I could upload files, so here it is again. Olivier Amrein (oenvoyage) created T42788: animation rendering crashes when 2 3d Views set to "material" shading mode are shown. Olivier Amrein (oenvoyage) created T41270: animated Spot Shape Size property doesnt update in GLSL viewport. Olivier Amrein (oenvoyage) assigned T38732: lock interface during rendering = impossible to click the icon to cancel the render to Sergey Sharybin (sergey). Olivier Amrein (oenvoyage) added a comment to T38123: EdgeSplit modifier - split angle backward compatibily error. Olivier Amrein (oenvoyage) raised the priority of T38123: EdgeSplit modifier - split angle backward compatibily error from to Needs Triage by Developer. Olivier Amrein (oenvoyage) raised the priority of T37991: Cycles crashes after a Timeout Detection and Recovery of GPUs through WDDM (win only) from to Needs Triage by Developer. Olivier Amrein (oenvoyage) raised the priority of T37495: Bad normal drawing when 2 levels of mirrored groups from to Needs Triage by Developer. Olivier Amrein (oenvoyage) triaged T37402: Blender 2.68 + 2.69 crashes after using Looptools - Circle several times as Normal priority. Olivier Amrein (oenvoyage) raised the priority of T37402: Blender 2.68 + 2.69 crashes after using Looptools - Circle several times from Normal to Needs Triage by Developer.